We Can Add “Typing This Blog Post” to the List, Right? Working from home today. KILLIN IT. Opened wine should be on there. The reason for your success was in the first item on the list. I think I could do with a cup right around now. Haha, love it! I am a list maker for sure. And I love that you are killin it, still in your PJ pants. Keep up the good work! Sweatz 4 lyfe! 1. Been reading your blog for awhile (don’t change a thing! ), but I’m a first time commenter. 2. I love your handwriting. Yes, your handwriting would make a nice font. I ripped my favorite pajamas pants the other day. It was tragic. looks like you got all the major ones completed. can’t leave the laundry in the washer… it’ll start to smell. however, it can sit in the dryer indefinitely and still be nice and clean when you get around to collecting it! From “take dirty clothes to laundry room” to “bring clean clothes back to dorm room,” I once took three days to complete the series. In shared college housing. Fun times. On your future task list, along with a co-worker space…(CONGRATS!) please add ” Ask Santa for new p.j.’s……. I hate putting laundry away. It’s become a cycle of wash-put on bed-plan on putting away-put on floor-consider it dirty again-wash and repeat. I respect the checklist. I LOVE the checklist. I am checklist obsessed. So I can ask with the confidence of one who neurotically makes prioritized checklists…. They just judge silently. And who cares about that? *Not that I’m speaking from experience here or anything. Had to laugh when I saw the “Change out of ripped PJ’s” was still unchecked. I’ve had days like that. I find nothing wrong with this list.. 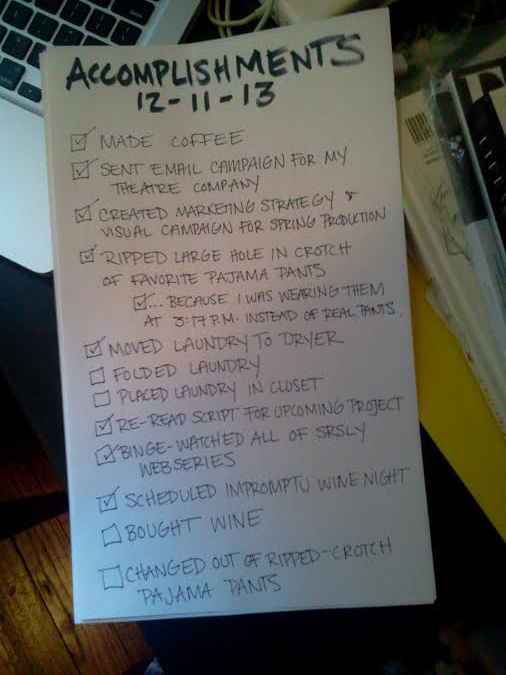 In fact, it looks a lot like my list of accomplishments most days. Especially scheduling impromptu wine nights.